The Green Globe Awards are NSW’s leading environmental recognition program, celebrating excellence, leadership and innovation in sustainability. On the 15th October an Edge team attended the Green Globe Awards at the Art Gallery of NSW, invited as finalists in the Waste and Recycling category. In 2014/15 Edge Environment was the recipient of a grant from the NSW EPA to generate Industrial Ecology activity in Sydney. We partnered with the Better Buildings partnership and have diverted thousands of tonnes of materials from landfill to productive re-use in new markets, at the same time saving thousands of dollars for the property companies we are partnering with. For our efforts, we were proud finalists for the 2015 Awards. As I reflect on the winning initiatives, such as City of Sydney’s Zero Waste, and our industrial Ecology work it is just so obvious. Just as making drink driving illegal, allowing women to vote, and stopping asbestos use in homes seems obvious now. Through promotion and awareness activity, such as Green Globes, we can make the winning initiatives of today tomorrow’s business as usual. We will continue to support the Green Globes and urge our clients and friends to also. If you would like to learn about how Industrial Ecology could apply to your activities, contact us. 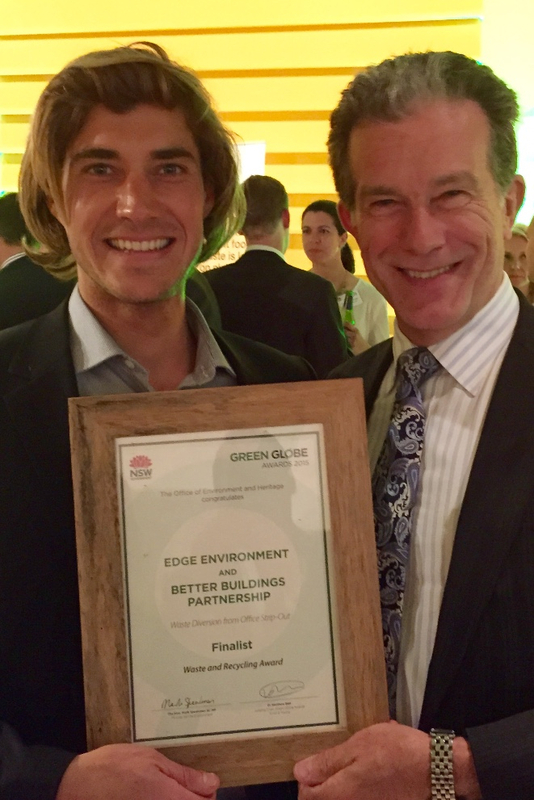 Image: Richard Morecroft, MC of the 2015 Green Globe awards, with Blake Lindley of Edge Environment.